are completely unbiased. Our only purpose is to provide you with accurate documentation and realistic replacement values. By far, the most important reason is for insurance purposes. Over the years, the value of your contemporary to antique jewelry, gemstones and luxury watches can fluctuate greatly. If your last appraisal is over two years old it may be out-of-date and, as a result, your jewelry could be insured for less than its replacement value. That means you risk a substantial financial loss if your jewelry is lost, stolen or damaged. 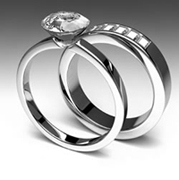 For your protection, we recommend that you have your jewelry appraised every two to three years. JAPSD will provide accurate appraisal reports based on current values so that you can obtain adequate insurance coverage. You may also want to determine the value or authenticity of your jewelry for estate and resale purposes or divorce settlement. 2. I already have an appraisal from the store where my jewelry was purchased. Why do I need an independent appraisal? 3. I have homeowner's insurance. If I lose my jewelry, am I automatically covered? NO. You are not generally covered for loss or damage unless you have your jewelry appraised and listed separately on your insurance policy. JAPSD will carefully document and photograph your jewelry piece-by-piece so you can have it properly listed. 4. How can I be sure my JAPSD appraisal is accurate? All laboratory tests are performed by G.I.A. Graduate Gemologists using the industry's most precise scientific instrumentation. We have been appraising jewelry for over 25 years and have been in the jewelry business for over 30 years. JAPSD will perform all of the necessary gemological tests and take digital photos of your jewelry pieces while you wait. 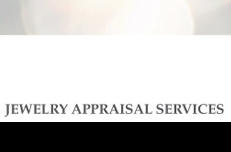 If, for any reason, we cannot finish your jewelry appraisal during your appointment you can come back and pick it up or we can mail it to you. We also respect your privacy; all appraisals are strictly confidential. Diamonds and other gemstones do not have to be removed from their settings during an appraisal. We are capable of arriving at accurate measurements, weights and qualities with the gemstones in their mountings. All laboratory tests are perfectly safe and will not damage or alter your jewelry in any way. 7. Do I need to make an appointment for an appraisal? YES. You do need to make an appointment so that we can allot the appropriate time to examine and appraise your jewelry items. Each jewelry piece takes approximately one half hour to appraise. 8. I cannot bring my jewelry in for appraisal. Can you still help me? YES. With our portable lab, JAPSD can provide appraisal services in the privacy of your home or office. This service is also available for on-site estate appraisals. we can confirm the quality and give you a purchase price evaluation. 10. In addition to my jewelry, do I need to bring anything else with me when I come for my appointment? Please bring all diamond grading reports with you (GIA, EGL or any other reputable laboratory). We will include them in our final appraisal report. Original receipts are also helpful as they often give exacting measurements, weights and qualities of gemstones before they were set in the mountings. 11. Do you certify and evaluate Internet purchases? We can certify and evaluate Internet purchases during a consultation session or we can issue a full appraisal report for this purpose. 12. Isn’t it to my advantage to have a value on my appraisal that is much higher than what I paid for my jewelry? Inflating the value on your appraisal simply means that you will pay higher insurance premiums without any other benefit. Many people think that an inflated value on an appraisal means that an insurance company will write a bigger check in case of a loss. Insurance companies generally arrange to replace jewelry instead of writing a check directly to the owner. Thus, it is really not to a jewelry owner’s advantage to have an inflated appraisal. 13. Should I try to get an appraisal that reflects a value that is lower than an item would cost me in order to save money on insurance premiums? This is dishonest and unethical and a reputable appraiser would not agree to do this practice. Furthermore, an insurance company bases your coverage on the value on your appraisal. If you suffer a loss and are grossly under covered, the insurance company may not be obligated to honor the claim. Each company is different, so check with your carrier. 14. What is the difference between a fair market value appraisal and an insurance appraisal? Fair market value is defined as the amount that an item would change hands for, in its current condition, in its most common market (pawn shops, estate sales, auctions – because it is most often a used item) with neither the buyer or seller being under pressure to buy or sell and both being aware of the relevant facts concerning the item (the seller knows what the item is worth as does the buyer). The sale is assumed to be to the ultimate consumer. Fair market value is used to determine the amount of estate taxes owed to the IRS. Sometimes courts ask for fair market value appraisals for property disputes like those that occur with divorce. Insurance appraisals are usually written to reflect what a new item would cost. Thus the two types of appraisals can reflect very different dollar amounts for the same item. Therefore, it is very important that the correct type of appraisal is used for the situation at hand whether it be an estate settlement, a divorce settlement or insuring your jewelry. There are many different types of gemstone cuts, each has it's own beauty. 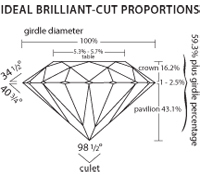 Top quality State-of-the-Art Equipment is used to evaluate your gems and jewelry. An evaluation will generally take half an hour for jewelry items.